This information is taken from wikipedia – although on the whole accurate your host at Lowlands Farm will happily discuss the local history with you. The village is mentioned in the Domesday Book as Ascric. At the time of the Norman invasion the manor was held byArnketil. Afterwards the lands were owned on behalf of the Crown by Count Alan of Brittany who granted then lordship of the manor to Gospatric, son of Arnketil. By 1251 the manor had come to the Fitz Hugh family who were also lords ofRavenworth and stayed with them until the 16th century. In the early 16th century the manor became the possession of Sir Thomas Parr. His son William died without issue in 1571 when it became the property of the Crown. In 1664 the manorial rights were leased from the Crown by Metcalfe family. The name Askrigg is of Old Norse origin, consisting of the combination of askr (ash tree) and hryggr (ridge), meaningthe ridge where ash trees grew, denoting the existence of Viking settlers and their farming. The oldest settlement probably dates back to the Iron Age. The village remained of little commercial importance throughout the thirteenth and fourteenth centuries when Wensleydale was extensively used for sheep grazing by the Cistercian monks, who became prosperous on the profits of the wool trade. In the fifteenth and sixteenth centuries, however, secular wealth became important in the dale following the border conflicts in the north and the Dissolution of the Monasteries throughout the country. 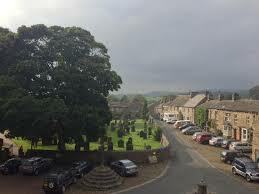 Askrigg was granted a Charter by Elizabeth I in 1587 for the holding of a weekly market on Thursday, and of fairs in spring, summer and autumn. Askrigg’s prosperity peaked in the eighteenth century when trade in textiles and knitting was most lucrative and the village supported many craftsmen and gained a reputation for clockmaking. The earliest mention of Askrigg clockmakers being a Quaker named John Ogden, who moved to Askrigg in 1680 and manufactured his clocks there until 1720. He was succeeded by Mark Metcalfe (1687-1776) and Christopher Caygill (1747-1803). Another well-known clockmaker was James Pratt (1787-1850). All three had sons who were also clockmakers. Two 19th-century clockmakers were John Stancliffe and John Skidmore. 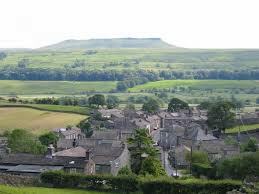 Askrigg was the home of the Wensleydale Metcalfe family who lived at nearby Nappa Hall. Mary, Queen of Scots, was once imprisoned in the house, possibly before she was moved to Castle Bolton further down the dale. 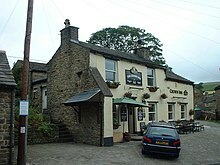 One of the local pubs, the Crown Inn, has been known under this name since the 1850s and there has been an inn at this site since the late 18th century. The other pub, the Kings Arms, was built in 1767 as a coaching inn by John Pratt, a local who had made a fortune as a jockey. Pratt was a racehorse breeder and master of the Askrigg Harriers during the 18th century. He kept his hunters and pack of hounds in a yard behind the house he built on Askrigg’s main street in 1767. The kennels and stabling date to the late 18th or early 19th century. The kennels had a semi-circular enclosure attached and the long row of stabling lay beyond. Pratt’s hunters were ridden in and out of his land through Robinson’s Gateways on the main street. The site has now been developed to provide holiday accommodation. The village once had a railway station that was part of the Hawes Branch of the North Eastern Railway from its opening in 1878 to its closure in April 1954.The Wensleydale Railway Association has plans to rebuild the railway from Northallerton (from its current western terminus at Redmire) to Garsdale including the re-opening of the station in the village. This would be done in the period between 2010 – 2014.